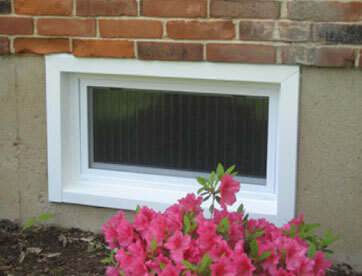 Basement windows, also called hopper windows, are vinyl replacement windows that are bottom-hinged and open inward for ventilation. For added safety and security, consider replacing low-to-the-ground windows with basement vinyl replacement windows featuring shatter-resistant Exolite. Perfect for applications which must meet egress requirements. Self-aligning and allows easy sash removal from your basement window.